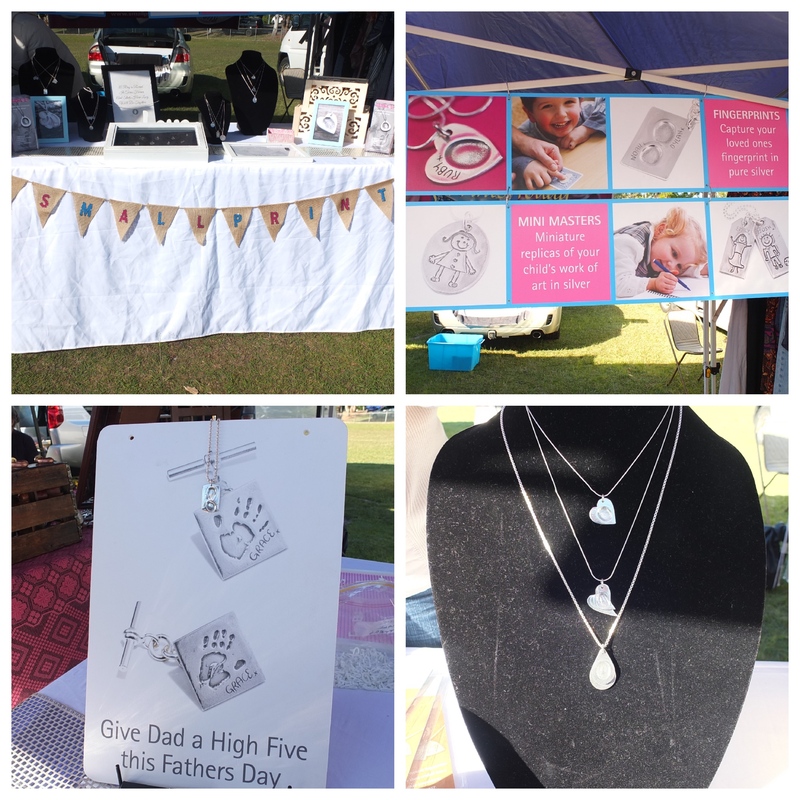 The Sunshine Coast Collective Markets in Coolum is definitely one of my all-time favourite markets on the Sunshine Coast. You might remember them as the Mooloolaba Collective Markets, who were 'wandering' for a while, searching for a new 'forever' home. Well, I am absolutely delighted to say that the Collective Markets have settled down and are nesting very happily in Coolum. And, it's not even a hassle to get to, one gets onto the Bruce Highway between Mooloolaba and Coolum and at the 'Yandina/Coolum' roundabout, visitors veer off to the right and there it isÂ…the Sunshine Coast Collective Markets on the grounds of Coolum State Primary School Junior Oval - it's that easy! The Sunshine Coast Collective Markets is not your average market - it is a collective of very talented local Sunshine Coast designers, musicians, artists, foodies, creators, vintage wares and lifestyle lovers. 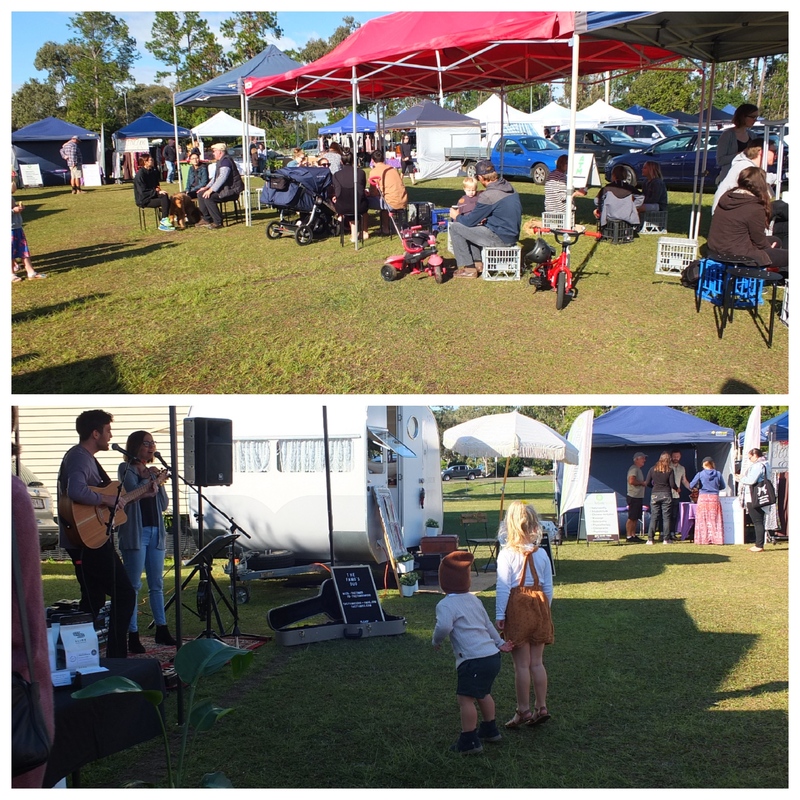 I can affirm that the Sunshine Coast Collective Markets have always been uniquely different, offering shoppers high quality exclusivity produced locally - no mass production and definitely no cheap and nasty imported products! 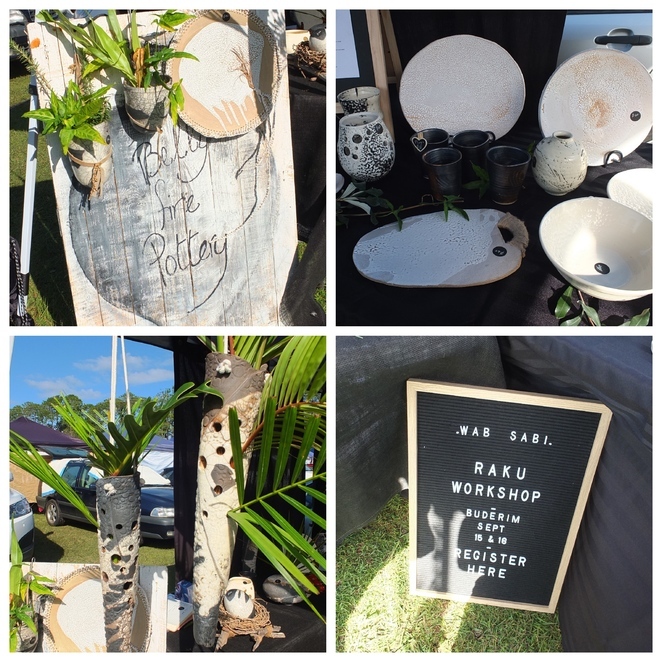 I have been following the Sunshine Coast Collective Markets around for a while - from Mooloolaba to Buderim and now to Coolum. I am so impressed by the dedication and determination of the organisers, ensuring their 'product' 'remains at an all-time quality and extraordinaire high, whilst ensuring there is always a 'permanent spot' for their loyal and oh-so talented stallholders. 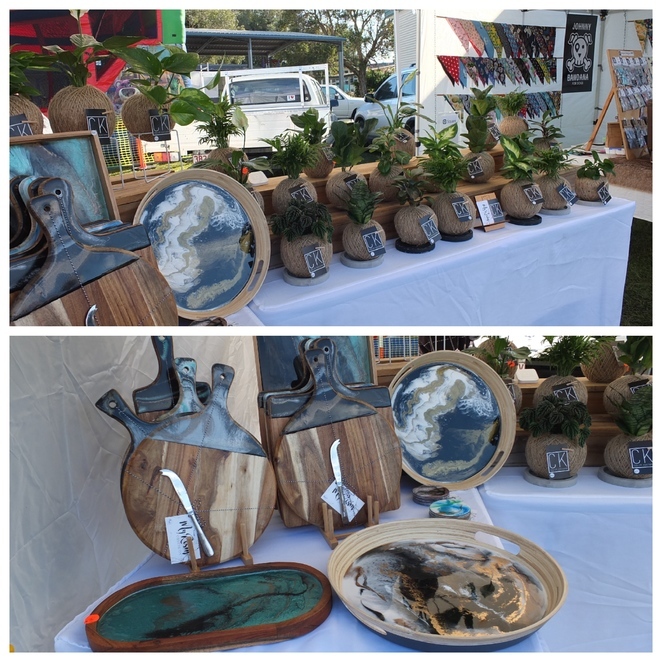 There is so much talent on the Sunshine Coast and the Sunshine Coast Collective Markets is the perfect outlet for these local creatives to showcase their flair and aptitude. Families, including our four-pawed buddies on a leash, can make a whole morning of it, there is certainly something for everybody. Besides the local artisans showing off their home-made wares, visitors can kick off their morning with a speciality coffee. Your choice: 'bring your own cappu or alternatively enjoy your early morning coffee in a very trendy ceramic returnable mug. The Slide Roasted Coffee will not disappoint! Slide Coffee Roasters were doing an espresso trade, with the queue nearly around the block (slight exaggeration - around the next two stalls), with coffee lovers being ever so patient, ristretto'ing in the sun, and latte'ing their feet tap to the most delightful music duo I had heard in a long time. And, all of this before their caffeine fix! The Famo's Duo were the very entertaining husband and wife musical duo, hailing from Noosa. This exceptional couple were that good, that I said to hubby 'let's have a party, any party will do, even a street party, just so that we can invite them too'. The Famo's music was fabulously appealing to all ages - even the littlies couldn't contain themselves! AndÂ…I believe that The Famo's are available to perform at weddings and corporate events too - I'd be diarising their name or clicking here to get an online quote - this musical duo is sure to book up really fast. I had a superb morning, wandering between the stalls, meeting ever-so-friendly vendors and just to tempt you, here's a taster of a few stallholders I had the privilege to meet. I regularly come across people who are looking for something flowery, either for a birthday, baby shower, hens, bridal, engagement and even nursery decor. Flower Vine Creative has beautiful handmade faux flower creations for event hire and/or purchase. CK or Coolum Kokedama is home decor with a living twist. Kokedama indoor plants will turn your house into a home. Same lady, two different talents! Elissa is the very talented creative with CK and My Resin Obsession, having only just in the past year been experimenting with Resin Art, creating stunning gifts. Who's furry family members wouldn't want a new bandana? Johnny Bandana creates reversible dog bandanas personalised with your doggie's name, nickname or favourite slogan - and all handmade with love! Johnny Bandana even have a loyalty stamp card for bandanas and bow ties - I'm not sure what you will get after every sixth stamp, perhaps a doggy bone? Country Coolum Plants' facebook page, is full of brilliant gardening tips from what to do in the garden on a cold winters day to how to grow stunning succulents. Country Coolum Plants make their own potting mix, passing the savings onto their customers. Their enchanting Fairy Houses would definitely make a little girl's heart sing or perhaps 'dolly' up a corner in a garden bed. Oh my gosh, I absolutely love the creativity behind Smallprint's company. Lauren Hook is the very talented lady who is able to capture your loved one's fingerprint, writing, drawing, hand or footprint into a pure silver keepsake. Lauren guarantees that each memento is totally unique and special, ensuring that you will always be touched by the ones you love with your stunning piece of jewellery. Next time you and your girlfriends are getting together for a 'mums and bubs' coffee, why not invite Lauren from Smallprint too. While the 'girls' are having fun, Lauren will fingerprint the littlies to show you just what she can capture with this totally unique concept and Smallprint also offers generous incentives for hostesses too. I really think Smallprint have taken the keepsakes of loved ones to a whole new level, being able to print babies right through to adults. Smallprint is also able to create mementoes of loved ones who have passed, all they need is a sample of your loved one's writing. Smallprint help you to capture precious memories forever. How about buying a 'Pothead' for that discerning person who has absolutely everything. These potheads are really cute, put your mosquito coil on the pothead's head and as the coil burns, the smoke comes through the mouth, giving the 'pothead' the appearance of having a smoke-o. Great conversational starters. Are you keen to join the ever-growing Sunshine Coast Collective Markets' family? Download the stall holder application form here, fill in all the nitty gritty 'stuff' and email back to: hello@sunshinecoastcollectivemarkets.com.au. Before I forget, parking is plentiful around the school area as well as on the big school oval off Barnes Lane. For those (like me) who forget to bring cash, there's an on-site ATM especially for those last-minute have-to-haves. 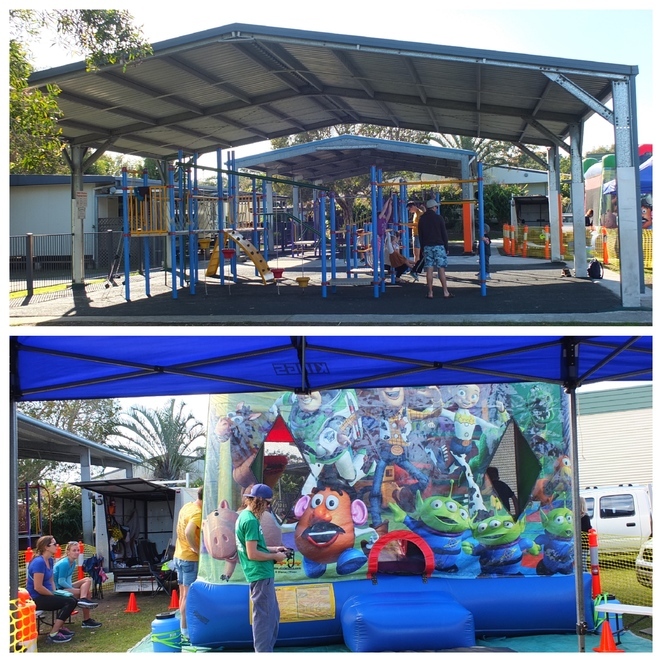 A fabulous childrens' play area is available, which includes a jumping castle - how awesome is that! Have fun, Sunny Coasters, the uniquely different Sunshine Coast Collective Markets are only on every fourth Sunday of the month, so don't forget to diarise the all-important dates. Such talent! Definitely make it a regular visit.